Someone asked me during a LIVE video why I choose to Capsule Wardrobe and if it was to save money. I didn’t have a very clear answer at the time, because stating that I do it to save money seemed a bit too simplistic for a resounding “yes”. 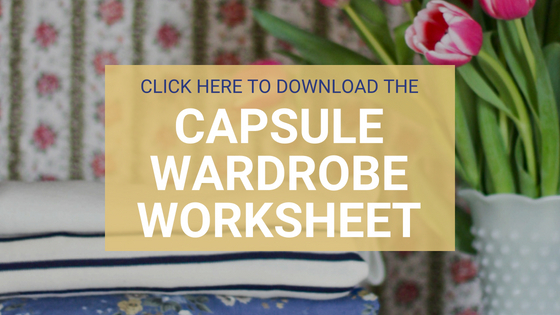 You can get a copy of my Capsule Wardrobe Worksheet by signing up for my email list in the right margin. Before I started to work toward owning less, I would look in my closet and feel like I had nothing to wear. Every time I went shopping, I wanted to buy more clothing. When I brought those things home, I only wore them a couple times before I wanted more again. I was challenged 4 years ago to go a year with out buying any new clothing. It seemed crazy, until I thought about how people used to live like that all the time. I tried it, if I wore something out I could replace it, but only by buying something used. It was life changing. I started thinking about my clothes differently and was way more particular about replacing clothing items that I wore out that year. Would I have said I needed it before I knew it was here? Do I already own something similar? Can I leave it here and come back to buy it tomorrow? 2. I Capsule Wardrobe to prevent waste. Culturally we live disposable life styles. Americans are throwing away 26 billion pounds of textile each year. My desire is to fight this mentality of waste in my life. Before I started using a capsule wardrobe I would buy something and only wear it a couple times before deciding I didn’t like it, or it didn’t fit right. Most of the things I was disposing of I had hardly worn. When I am pickier about what I bring into my closet, I throw out less. The last 3 pair of jeans I’ve thrown away were tossed because they literally had hole worn in the thighs (no thigh gap here). Can I buy this item used or wait for a sale? Do I have something in my closet that would work just as well? How many uses will I get out of it (both number of wears and mix and match options)? 3. 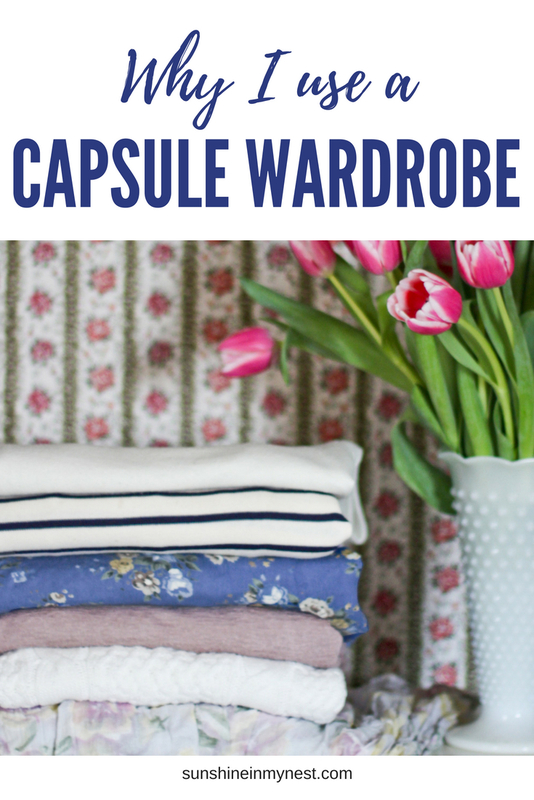 I Capsule Wardrobe to make dressing easy. 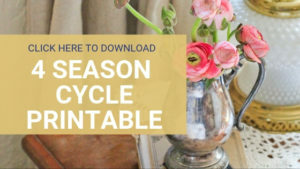 When I only have in my closet what is seasonal, I love, and what fits it is so easy to get dressed! I hang everything onto 25 velvet hangers and everything fits in the closet with LOTS of room to spare. There is no digging through to see what I should wear, everything in my closet can be grabbed and worn. Everything is clean, nothing has holes, and everything fits me exactly as it should. It feels like I’m dressing from a boutique every morning. I also limit my choices to clothing that reflects my life style. They hardest phase of dressing for me was when I switched from an office job to being a full time mom. The clothes I wore at work were not practical for my new job. Phasing out old lifestyle clothing and bringing in clothes that worked for my new life took a while, but I’m glad I switched. Can I wear everything in my closet with the way the weather is right now? Does my clothing reflect my lifestyle? Is everything in my closet in good condition? 4. I Capsule Wardrobe to save money. Saving money should probably be a subheading under minimizing waste, but I decided to give it one all of its own. When I choose not to spend money on clothing I don’t need, I have more money to buy things we need. I’ve chosen to live this way so we can live debt free, and pay off our house faster too! Most of the things I buy are less than 1/10 the original price and are also hardly worn. Shopping second hand keeps that item from hitting the land fill and me from wasting additional money on the exact same item. Also not going places designed to make you want to buy things is a bonus. Mall stores are designed to make you want to buy things. I do splurge on jeans, because I have yet to find a pair at a thrift store that someone hasn’t shrunk in the dryer. Do I have the money for this RIGHT NOW? Do I want this more than I want (new carpet, a remodeled kitchen, a bed spread, etc)? 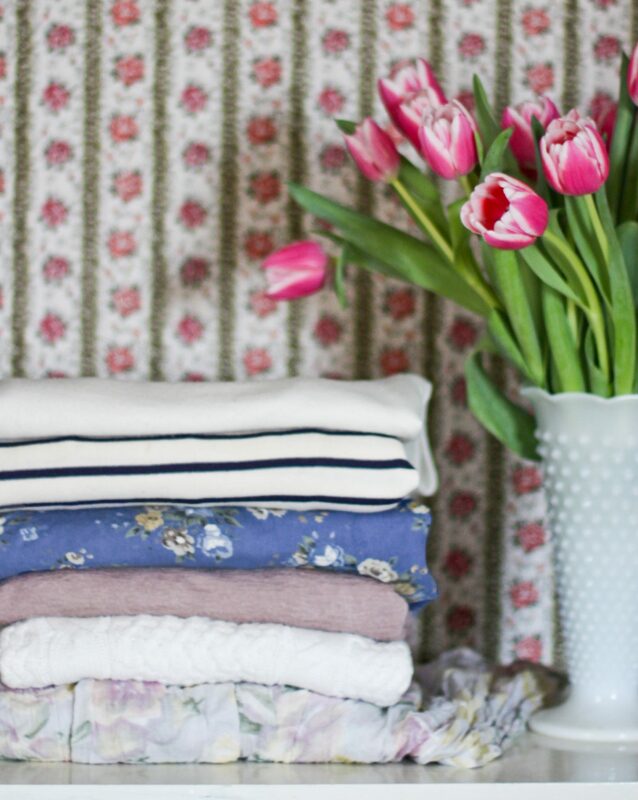 Would you like to use a capsule wardrobe? You can kick start it by downloading my Capsule Wardrobe Worksheet, or check out building a maternity capsule wardrobe. Next Post Why is Sunshine in my Nest about Gratefulness? Elizabeth, wow this post opened up my eyes to a lot of things! I always assumed people who did a capsule wardrobe just weren’t into shopping or fashion, but boy was I wrong! And I have NEVER even thought about the fact that buying stuff over and over again is wasteful to the planet. Hmmm…I may actually consider this now! I think my husband would be elated! I need to get serious about doing this! I have thought about it so many times before but talk myself into “I might wear it sometime”. Thanks for the inspiration to get back in the saddle!